On this page, I'll include one or more sets of instructions that may help others get involved in or become more proficient at my hobby. Step 1: Pry off the wheel cover with the wrench and loosen the wheel nuts. Step 2: Put the jack under the car. 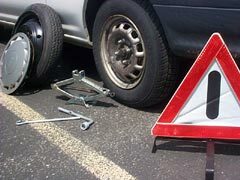 Step 3: Use the wrench to jack the car until the wheel is about three inches off the ground. Step 4: Remove the nuts, mount the spare, and thread the nuts back on by hand. Step 5: Lower the car, remove the jack, and then use the wrench to fully tighten the wheel nuts. In this area I'll include a list of all the material necessary to perform the tasks I'm describing on this page. In this area I'll define any specialized vocabulary that it's helpful to know in order to perform the tasks described on this page.